Whoever says "eye", says "mouth", whoever says "mouth", says... "Camera," of course! Does the sequence seem completely twisted to you? Thanks to Cogit, you will learn to connect everything with anything. 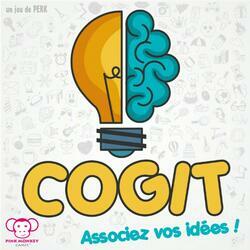 Don't panic, Cogit is a cooperative idea association game, so you will smoke your neurons in a group to try to reach, together, the perfect score of 20 out of 20. Cogit is divided into three complementary phases, during which you will have to use your sense of deduction, your imagination and your memory! The 98 images represented in the game allow no less than 8000 possible combinations! So, let's go for 20 minutes of crazy laughter? On your marks! Are you ready? COGITATE! Contents of the box : 98 cards, 1 rule of the game.